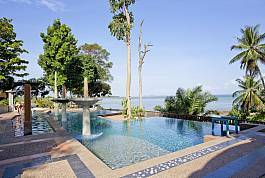 Krabi Beachfront Resort Deluxe Suite not only sits in an oceanfront resort, it also has wonderful views of the luscious green forest and glorious mountains. With great communal facilities and plenty of space, it's a perfect place to stay if you want luxury and great vistas at an affordable price. Set within one of the most idyllic areas on the island just 20 meters from the beach, this one-bedroom sea-view villa has all the comforts you'll need for a great island getaway. 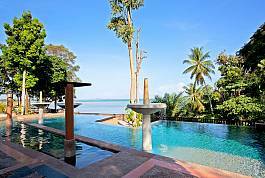 The villa has one bedroom with two single beds and the usage of the resort's communal facilities such as a swimming pool and fitness center. 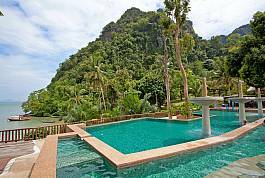 Located at Ao Nam Mao in Krabi, just 4km from Ao Nang, the Beachfront Resort Oceanside Suite is exceptional and is situated right on the sand in a beach-side resort. If you want beach views that are even better than the ones you've seen in the movies, then this villa is the place you should stay. It has some of the best mountain and ocean views around. 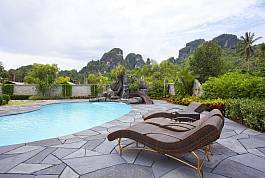 With views of some of Krabi's famous dramatic limestone karsts, this cosy two-bedroom villa beside a swimming pool is a lovely getaway for a holiday in one of Thailand's most beautiful and scenic regions. 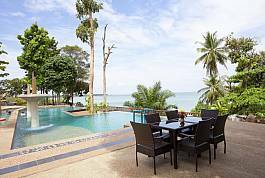 This two-bedroom villa is filled with Thai character and has all the comforts you need to enjoy your superb base where you can totally relax and from where you can head out to explore the stunning scenery and attractions of one of Thailand's most spectacular regions.